Lauren DeJulio Bell teaches methods courses in English Education, and in the First Year Writing Program. Her research interests include community-based literacy, arts education, English teacher preparation, and young adult literature. She is specifically interested in the role of teachers and students in relation to equity, justice, the arts, and humanity in the context of local communities. She is currently editing a book with colleagues (tentatively titled Growing Up Chicago) that highlights young adult stories from local Chicago authors. She also leads a community project (We are All Chicago), where she works in Chicago schools and neighborhoods to foster civic engagement, community writing, and artistic endeavors. She organizes and participates in a yearly writing group, where poets contribute a poem a day for National Poetry Month. She has acted as the Co-Director of Chicago Teachers: Inside Out, a public art and education project, and volunteers in various community and charity organizations throughout Chicago. 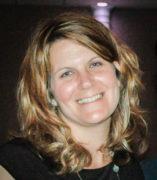 Her article, “Turning Schools Inside Out: Connecting Schools and Communities Through Public Arts and Literacies” was published in the Journal of Language and Literacy Education in 2014.